Bathed in smoke and quickly changing lights, NIN delivered a massive set to close down the third and final day of Lollapalooza 2008. This was an interesting shoot. Following the chaos of photographing Radiohead and Rage Against The Machine, I would say this was smoothest of all the headliner shoots at Lollapalooza with regard to logistics. As they say, third time's a charm. 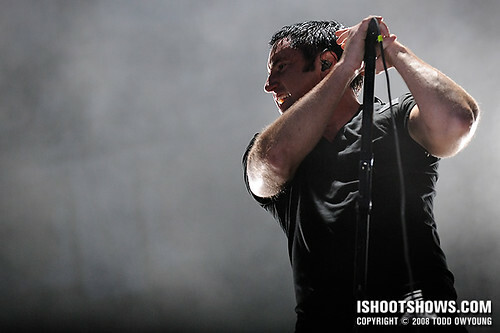 Many more photographers were approved for NIN's performance than had been for Radiohead and Rage – so many, in fact, that we were divided into two groups. I was in the first group, and was granted access to the photo pit for the first two songs. We were instructed by the event organizers that music would start before we were allowed into the pit, but not to worry, as the band would not take the stage before we were ushered in. As the intro music ended, there was a mad dash into the pit as the first wave of photogs rushed into position. Now, everything up until this point was pretty smooth. The actual photography was another matter entirely. We were greeted with shock and awe, NIN style, which essentially meant massive amounts of rolling haze and rapidly changing lights. 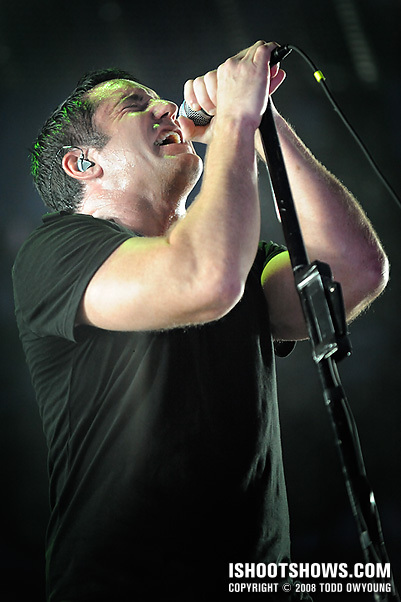 For the most part, Trent Reznor was dramatically lit with brief flashes of light, coming from the sides as well as from below. Epic amounts of smoke were used for this set, billowing in from the back and sides of the stage in such fierce quantities that image making was impossible at some points due to the obfuscation. 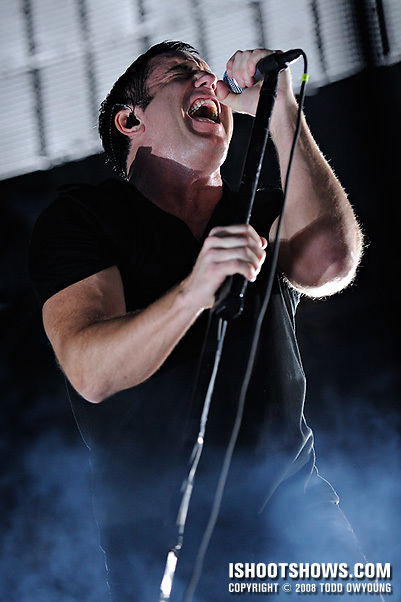 As a result of the general chaos and confusion of the first two songs, I made the decision to focus almost exclusively on Reznor. I used the Nikon D3 and Nikon 70-200mm f/2.8 exclusively for this set. Previous ArticleAre you on Twitter? We really have to discuss that, there’s now two bands from which I would absolutely love to buy some prints. Although it seams that this set is a bit out of balance with so many shots from Trent alone I do think you captured it right! Keep up the good work, and sorry for naggin’ about those prints. I understand if your just too busy to take care of that! Hey Celso, thanks for the comment. We’ll get you sorted out once I have a chance to breathe! 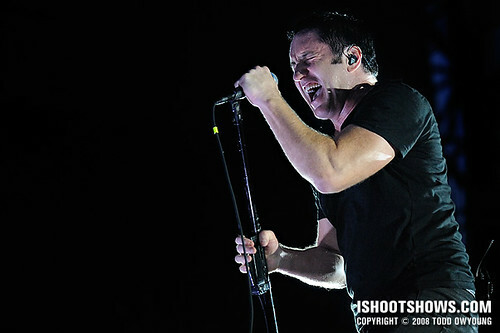 Glad to hear these shots capture Trent for you. 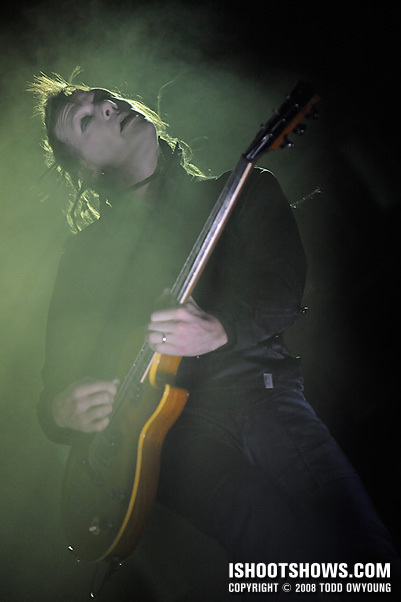 Given the short time frame, I mainly focused on him, only deviating for a few shots of Robin Finck, who was trashing away stage left. The shock & awe may have been bad for photographers, but great for the audience! Loved their show in Philly back in August. Still, you managed to get some great shots! Hey Steve, thanks for the comment. The show looked great from the crowd – just one of those disconnects of experiencing the show as a fan versus as a photog. I think one reason for the production was the scale of Lollapalooza. More photo-friendly lighting simply would have been dull to the crowd by comparison, and the effects did go with the lighting. Wow, looks totally brutal. Love the ragdoll head with the dutch on #3. 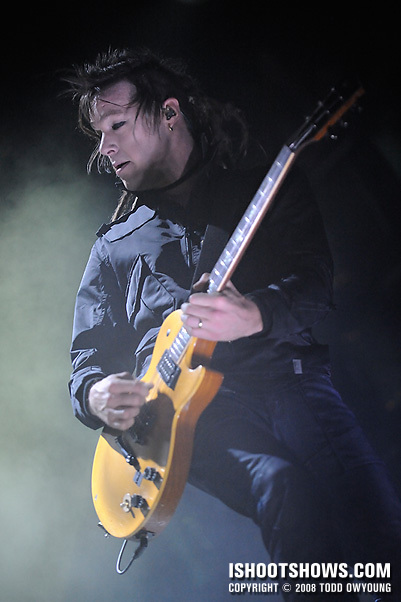 Hey Chris, it was probably the toughest shoot at Lollapalooza with regard to actual photography. The good part of the performance was that the band wasn’t set back too far on the stage, so the 70-200mm was generally just fine for this gig. Thanks for the feedback, Robin Finck was trashing about in such a manner I had to tear myself away from Reznor for a second to snap him. Hey Jessie, thanks for your comment. When the production for this show worked, it worked. Have to give it that. I am a humble consumer of photography. I love the sixth picture of this set. The pesky smoke wisps across the bottom quarter of the photograph. Trent looks like a character from H.P. Lovecraft, rising from the clinging mists to howl. I loved that show. Thanks so much for the photographic memories that add so nicely to the ones I keep in my head. Hey Portia, thanks for your comment. I’m very glad to hear you enjoyed the shots, and thanks for the lovely descriptions of how you see them. Hey Alan, thanks for the comment, glad to hear you like the shots. This is ridiculous! I love smoke, but if it makes some shots impossible — that could quite possibly be too much. Looks like you did really well, though, with the conditions you described. I originally liked 6, better than 3, but I think I agree with Chris, I think the ragdoll head has more character. So, my picks are 1, 2, and 3. 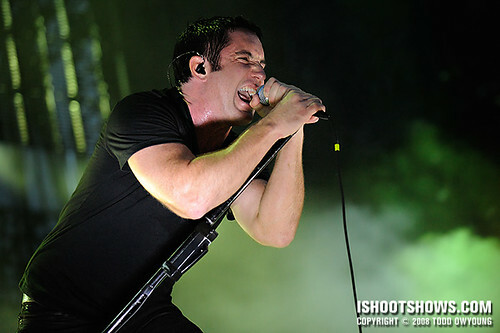 Love the emotion from Reznor. Hmm. Looks like I forgot to un-mark the italicize. Hey Chris, thanks for your thoughts and picks for this set.